The European and International Federations of Journalists (EFJ-IFJ) today backed their affiliate, the Nederlandse Vereniging Van Journalisten (NVJ), in condemning the killing of a Dutch photojournalist while covering clashes in the Libyan city of Sirte. 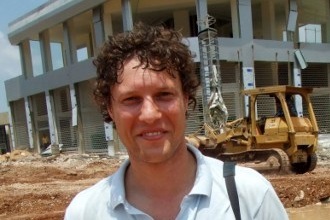 On 2 October, Dutch journalist Jeroen Oerlemans (45) was killed by sniper fire as government forces battled Islamic State group holdouts in the coastal city of Sirte, a jihadist stronghold 450 kilometers east of the capital Tripoli, media reported. Forces allied with Libya’s UN-backed Government of National Accord are trying to take the city back from jihadists in an offensive that started in May and which resulted in the killing of Libyan journalist Abdelqadir Fassouk in July. Reports said that Oerlemans was shot in the chest by a sniper while he was out with a team that clears mines and transferred to the Misrata city’s hospital, where pro-government fighters are also treated. The photojournalist was working in Libya for numerous publications including the Belgian weekly Knack magazine, which confirmed his death. Oerlemans had previously covered conflicts in Afghanistan, Syria and Libya in addition to writing stories about the journey made by migrants to Europe. He was abducted and wounded in Syria in 2012 with British photographer John Cantlie, but freed a week later thanks to the assistance of the NVJ. The photojournalist is survived by a wife and three small children. Both Federations backed their affiliate and sent their condolences to the photojournalist’s family, friends and colleagues. “We are appalled by this outrageous killing of an innocent journalist, husband and father of three,” said IFJ President, Philippe Leruth. “We honor the work of Jeroen Oerleman, who was committed to show what was happening in this fight with impartiality and professionalism. We demand a prompt investigation so that the killer is brought to justice and faces the full force of the law”. EFJ President, Mogens Blicher Bjerregård, added: “Two years after the killing of 26-year-old French photojournalist Camille Lepage, the death of Jeroen Oerlemans in Libya reminds us of the urgent need to provide assistance and protection for photojournalists working in conflict areas. A few days ago, the UN Human Rights Council adopted a resolution on the safety of journalists. It is time now to take action”. Dutch foreign minister Bert Koenders also mourned his death. Picture credit: Harald Doornbos / ANP / AFP.